This game is yet another 3D remake of one of the best all-time classics in the history of PC games-Tetris. BUT it is in fact LIKE NO OTHER! It's got absolutely fantastic 3D industrial style graphics, it's got 5 different game types to suit any kind of player: Revolution, Pentix, Emptix, Kids and Retro, it's got superb stereo sound. 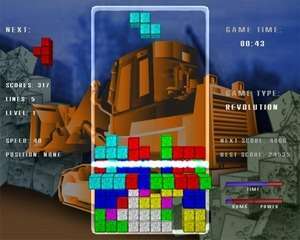 Tetris Revolution 1.7 is a shareware program and can be used as a demo to try the software until the free trial period has ended. A full version of the program is available after the trial period ends. For security reasons, you should also check out the Tetris Revolution download at LO4D.com which includes virus and malware tests. Additional screenshots of this application download may be available, too. Tetris Revolution download been highly rated by our users.